Tanah Rata Bus Terminal is the only bus terminal in Cameron Highland. The terminal is conveniently located at the Tanah Rata, where it is one of the tourist hotspot in Cameron Highland. Besides that, tourists can easily connect to another tourist hotspot Brinchang, by walking or taxi because Brinchang is just 4 kilometers further up from Tanah Rata. Tanah Rata Bus Terminal serves the outbound routes of Cameron Highland to Kuala Lumpur, Cameron Highland to Penang and Cameron Highland to Ipoh. 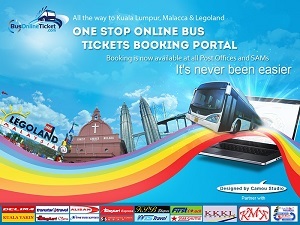 Besides that Tanah Rata Bus Terminal also serves as the inbound terminal for Kuala Lumpur to Cameron Highland, Penang to Cameron Highland and Ipoh to Cameron Highland. Currently, Only a few bus companies are utilising the terminal for boarding and alighting, for example Unititi Express, GT Express, CS Travel, Kurnia Bistari and Perak Transit. Passengers could buy bus ticket over the counter in the terminal or book ticket online as shown below table. Below tables are the summary of bus schedule of respective coach companies like Unititi Express, GT Express, and Perak Transit.